You can’t have a blog on Paris without mentioning the infamous Préfecture de Police. This is where one goes for a handful of administrative documents in France, and in a foreigner’s case, for your titre de séjour– the card that gives you permission to live in France and acts as your “identity card.” Once you move to Paris the Préfecture kind of becomes part of your life- like the post office, the bank, the grocery store (okay, maybe we won’t go that far). After a while you just kind of get to know it, and most expats seem to have a story to tell- from waiting in line to being sent back home to fetch a missing document, from misunderstandings with employees to just plain confusion. Maybe I’ve just been lucky, or maybe I’m just strange, but I actually kind of like going to the Préfecture. The old stately building in located right in the center of Paris, on Ile de la Cité. I usually arrive by metro, anxiously poking my head out of ground to have a peek at the row of green huts lined up out in front. These little shops are overflowing with all sorts of plants for sale- and many also display Christmas ornaments that are always fun to look at through the large glass windows. Then I turn around and see the stately Préfecture– and my husband waiting patiently for me on a bench. 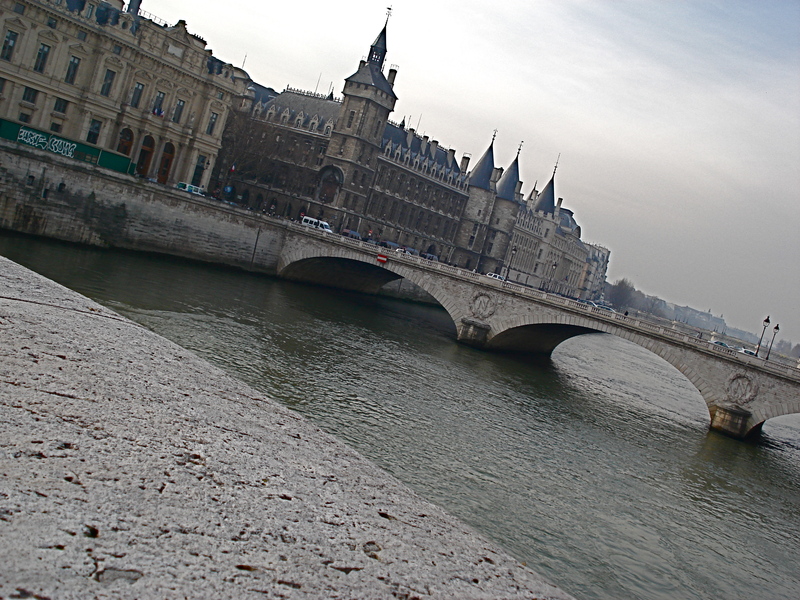 This afternoon, though, I decided to take the 72 bus which strides along the Seine and lets me out on the north side of the water, so that I have to cross over the Pont Notre Dame in order to get to the island. This is my favorite part of the journey- crossing the bridge and looking out over the Seine toward the west. No matter what time of year, or what time of day, the sky is always striking. I’ve seen pale hazy pink, bright clear blue, and cold misty grey hovering above the rows of bridges. What always surprises me about the Préfecture is actually how quickly it all goes. Since we were married, Sébastien and I have had to return every year to renew my titre de séjour, and then go back a month or so later to pick it up. While the initial meeting with an agent takes longer, I can usually bet on ten or fifteen minutes to pick it up- I know, not the usual story we hear. The secret is knowing where to go and in what order. When it’s your turn, you walk through the doors, smile and say “Bonjour” to the agent, sign a paper and walk back out the door with a shiny, laminated card. Then you walk out the exit, which is to the south- completely the opposite direction from where you came in. Your entire body feels weightless and smugly satisfied because, after all, you’ve just accomplished something and, admit it, you’re happy to know Paris is your city for at least another year- as though it’s yours and only yours- and you walk past Notre Dame, back over the Seine, and look out over the ever-present sky, remembering all the reasons you’re in Paris in the first place. This entry was posted in Everyday Life in Paris. Bookmark the permalink. I am certainly impressed, but not really surprised, by how well you know your way around that little city of yours with the big sky. (well, not as big a sky as you’ve written about in New Mexico.) I can’t wait until you can show me around there again!